The Endangered Species Act is more than 40 years old, and passed the U.S. Congress with strong bipartisan support. Many species and the habitat areas they depend on have been saved by the protections afforded by this essential law—bald eagles, gray whales, peregrine falcons and several others. Unfortunately, lawmakers and special interests have increasingly expressed disdain for the “burden” of having to care for species that are so embattled that their populations are on the brink of extinction. Now, we face what scientists are calling the 6th Great Extinction, with more species dying at higher rates than has ever occurred in recorded history. But this time, the extinction event is not caused by a cataclysm affecting global climate and ecosystems, but by generations of unsustainable human activity. More than half of all species of plants and animals are currently on the move due to human-caused climate change, with ecosystems shifting schedules and in some cases crashing, seasons changing, and key habitat areas disappearing. Many studies have shown the manifold and long-term benefits of wildlife habitat preservation and restoration; efforts to protect native wildlife often result in more resilient and productive landscapes, cleaner water and air, a healthy biodiversity in plants and animal species, and high-quality recreational opportunities. Protected floodplains and waterways, creative and regenerative farming practices, restoring diverse native plants to wildlife corridors as well as urban areas, and drastically reduced chemical use are all good examples of this. As we have done for years, Our Children’s Earth Foundation will continue to stand up for animals, animal rights, and critical wildlife habitat. We will work in all possible ways to preserve critical habitat areas for all critters and especially the most vulnerable among us. We utilize education, advocacy, and litigation to help reach this goal. For more on our wildlife-related education and advocacy work, check out our ENDANGERED EARTH ACTIVITIES and FILM FUND programs, as well as CURRENT CAMPAIGNS. In addition to lawsuits specifically focused on endangered and threatened species, our actions are strategically developed to provide maximum health benefits to humans and wildlife alike, especially in coastal areas. For example, our Sick of Sewage campaign (discussed in more detail on the WATER PROGRAM page) reduces health risk for people while also benefitting coastal ecosystems by forcing cities to reduce and prevent ongoing sewage dumps to coastal waters, which are often deadly to birds, fish, and marine life. See below for summaries of OCE’s key cases and actions aimed at protecting wildlife and the habitat they need to survive and thrive. A full list of OCE’s cases can be found here. OCE submitted comments in 2014 to strongly discourage the U.S. Fish and Wildlife Service ("USFWS") from reclassifying Florida and Antillean Manatees from "endangered" to "threatened" under the definitions of the U.S. Endangered Species Act. As we noted in our letter, after the USFWS 5-year review of manatee status in 2007, USFWS failed to implement basic protections that are necessary for safeguarding manatee habitat for the future, as required for species downlisting. These protections are still not implemented. 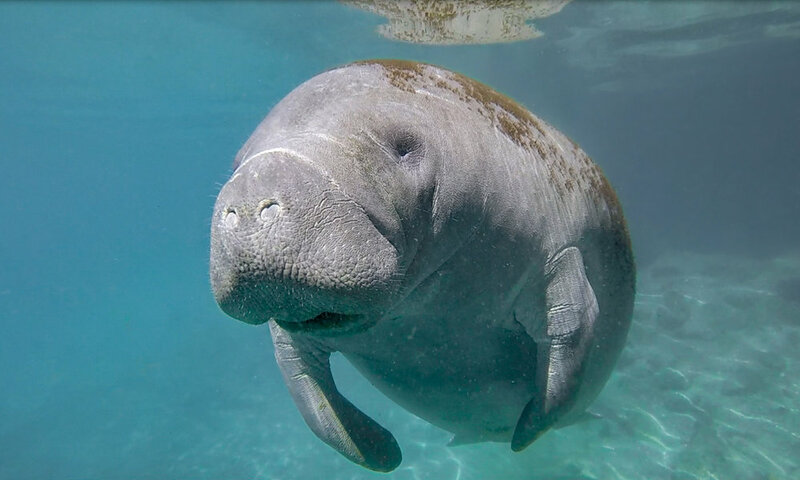 Furthermore, the science since the 2007 status review shows that manatees of both the Florida and Antillean subspecies face significant, ongoing, and potentially increasing risks from habitat loss, disease, human impacts, and other threats. For example, from 2010-2013 alone, nearly 2,500 manatees died in Florida waters, resulting in the death of 48% of the highest minimum population ever recorded (5,077 in 2010). These facts alone strongly indicate that a reclassification of manatees from endangered to threatened is unwarranted, or at best, extremely premature. We also pointed out that USFWS cannot assume that threats from watercraft will remain at current levels in the future, for either the Florida or Antillean manatee. Given expected population growth and the historically-established tendency for human populations to concentrate on coastal areas, the threat from watercraft vessels must be expected to increase. The threat from vessels will definitely increase if manatees are reclassified as threatened rather than endangered. Special interest boating groups and developers have already been clamoring to roll back important protections for manatees (as well as other vulnerable species). The slow-speed zones off the coast of Florida protect manatees from horrific injuries and death due to watercraft. Reclassifying the species will necessarily lift the slow-speed restrictions and result in more and higher-speed boat traffic, that will predictably harm manatees and other marine life. This result would undermine and undo recent progress in protecting remaining habitat areas. OCE is encouraging state agencies to require a series of projects in the San Francisquito Creek watershed, which spans from the Santa Cruz mountains to the southern part of the San Francisco Bay. Much of this special watershed is undeveloped and preserved as open space, including most of the headwater streams that feed into the watershed's namesake San Francisquito Creek ("S.F. Creek"). S.F. Creek is perhaps most well-known for a famous redwood tree, El Palo Alto, that grows on its bank and for which the city of Palo Alto is named. Locally, S.F. Creek is also famous as one of the last remaining waterways in the entire San Francisco Bay Area that has never been channelized and thus still supports wild steelhead trout. Steelhead are the anadromous (ocean-going) form of o. mykiss. Like salmon, steelhead return to their native streams to reproduce, nourishing surrounding ecosystems in the process. Unlike salmon, steelhead can complete this cycle multiple times, living up to 11 years. Steelhead can grow very large, and can jump over obstacles upwards of 15 feet high. They are beautiful and awe-inspiring even to seasoned anglers, who sometimes call them “gray ghosts” or “this fish of a thousand casts” due to the notorious difficulty of catching a wild steelhead. California's wild steelhead have declined 80-90% and have been protected by the Endangered Species Act since 1997. Our campaign to force action and public disclosure of relevant information by the lead federal agency, NOAA / National Marine Fisheries Service, was successful (more about that through our Government Transparency program. We continue to monitor progress toward permitting projects that will restore habitat for the native species that have been in the S.F. Creek and its headwaters for millennia. OCE served as a plaintiff in a key lawsuit to prevent sewage dumps from the Sand Island Wastewater Treatment facility near Honolulu and Waikiki. We negotiated a sweeping and long-term agreement to require significant upgrades by deadlines that are enforceable by a court. During OCE's long experience challenging dirty municipal sewage treatment plants, we have found that court-enforceable schedules are by far the best way to ensure that cities will dedicate the significant resources necessary to ensure that their sewage infrastructure is repaired, upgraded, and brought into compliance with environmental laws. Sewage pollution is disgusting. It is terrible for water quality and human health, terrible for ecosystems, and terrible for cities and residents especially in coastal areas that often rely on tourism and water-related recreation to help local economies thrive. The most heartbreaking impact of sewage pollution are the deaths that result. Bacteria in untreated or partially treated sewage can be deadly to humans and wildlife alike. Sewage pollution also overloads "nutrients" in water that can exacerbate algae blooms including red tide, which regularly kill fish and sea turtles. Hawaii is literally the endangered species capitol of the world, with its rare ecosystems that have provided a haven for threatened and endangered species including Hawaiian Monk Seal, five species of sea turtles, and thirty species of birds. About six years after we filed suit, Honolulu agreed to address Clean Water Act compliance with a schedule that can be enforced by a court, phasing in major upgrades, repairs, and programs by deadlines in 2020-2035. Honolulu was also required to pay a penalty for repeated pollution in violation of federal law, and estimated that the necessary changes to the sewage systems would be several billion dollars, long overdue investments in critical infrastructure of the people (and wildlife) of Oahu. Together with our co-plaintiffs, OCE also insisted that our agreement with Honolulu included preventing millions of gallons of raw sewage from being discharged, and secondary treatment of around 100 million gallons per day. By increasing treatment levels, we ensured that Honolulu will reduce its discharges by 3 million pounds of total suspended solids and 30 millions pounds of biological oxygen demand annually.